Hey guys! I am excited to share my first Holiday Gift Guide with you guys! 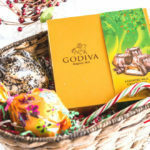 It’s hard to believe but it’s already that time of the year where everyone is looking for gifts for their loved ones. 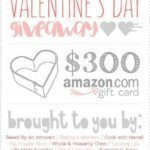 I am sharing some of my favorite things which I personally love and think that they would make great gifts. 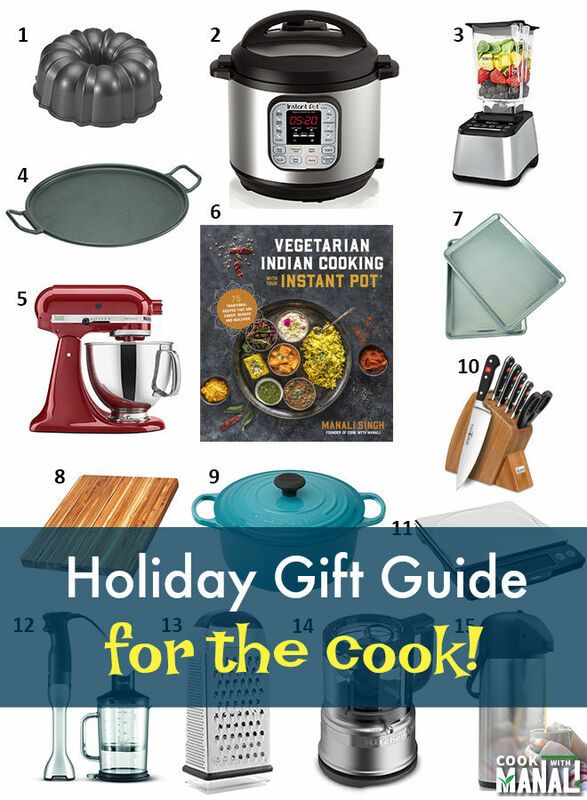 Not surprisingly, they are all kitchen gift ideas! 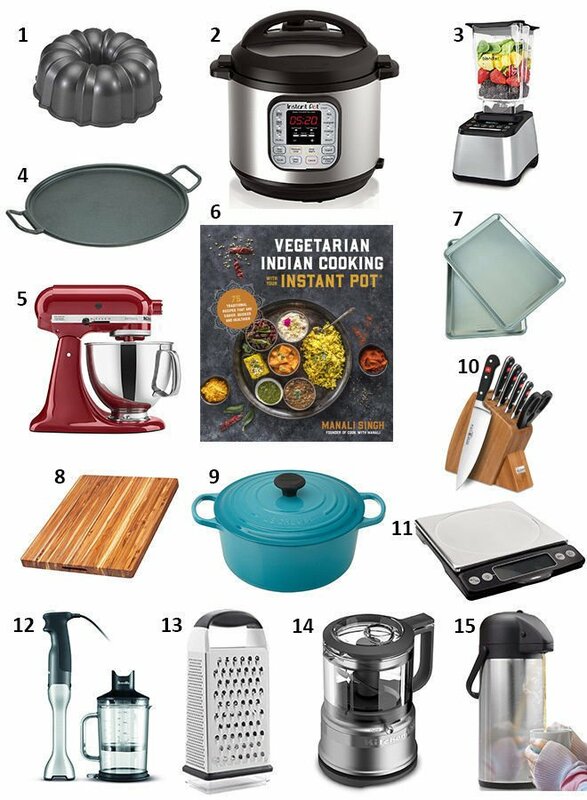 Since I pretty much spend most of my day in the kitchen, this gift guide is focused on the cooks, chefs & bakers! I own each one of these items and can’t do without them. Hope you find something that you love! 1- Nordic Ware Bundt Pan Bundt pans are so pretty and a must have for anyone who loves baking. I love that you don’t need to do anything fancy to make them look pretty, they are just so pretty as is because of their shape! 2- Instant Pot There’s a reason why Instant Pots all are the craze! I use my Instant Pot everyday for my day to day cooking. This electric pressure cooker surely makes life in kitchen much easier. I highly recommend the 6 Qt DUO model. 3- Blendtec I use my blendtec for pretty much everything – smoothies, chutneys, grinding batters, nut butter, you name it! 4- Pizza Stone This makes homemade pizza crust so much better. For anyone who loves making pizzas at home, this is a must have. 5- Kitchen Aid Stand Mixer If there’s one gadget I can’t live without, it’s probably this! My life is incomplete without my stand mixer. 7- Baking Sheets A pair of good baking aluminium sheets is a must for any kitchen. I love these aluminium ones! 8- Teak Cutting Board A good cutting board which is sturdy and durable. 9- Le Cresuet Dutch Oven It would not be wrong to say that I am obsessed with these dutch oven. 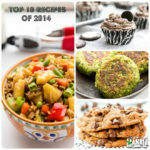 These last a lifetime and make just the perfect gift for anyone who loves to cook! 10- Wusthof Classic 7-piece Slim Knife Block Set A good set of knives is essential for anyone who cooks. I have been using this set for 7 years now and I absolutely love it! 11- Kitchen Scale I can’t possibly cook or bake without my kitchen scale. A lot of recipes use grams and oz in place of cups and that’s why having one of these is so important. 12- Immersion Blender This blender changed my life- in a way I didn’t know it was this easy to make soups and sauces! I have been making so many soups since I bought one of these. 13- Box Grater Perfect for grating anything from cheese to chocolate to veggies! I love that this one also comes with a small container for measuring and storing the grated food. 14- Mini Food Processor This is such a handy food processor, takes limited space in the kitchen and does it’s job just fine. 15- Thermal Coffee Airpot This airpot keeps beverage hot for hours! I can’t tell you how much I love this especially for parties. We usually fill the pot with chai whenever we have a party at home and it stays piping hot until the party ends. 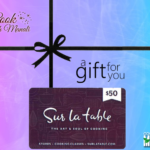 $50 Sur La Table Gift Card Giveaway!